The message from the Prime Minister which follows should be delivered to The White House for the President when the lunar astronauts are back in the mother-ship. You should not deliver the message until it is certain that the astronauts are safely back within the mother-ship. Please report by Flash telegram as soon as the message has been delivered. We shall publish the text of the message here as soon as you have reported delivery. 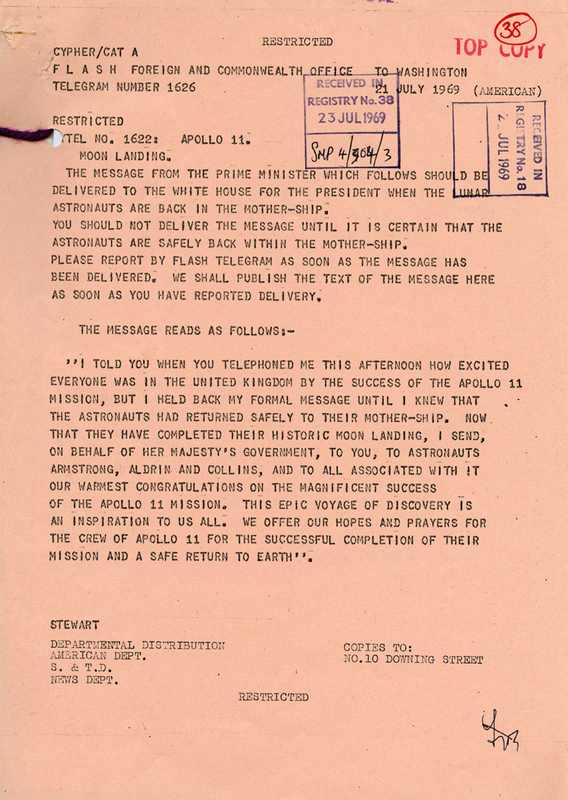 “I told you when you telephoned me this afternoon how excited everyone was in the United Kingdom by the success of the Apollo 11 Mission, but I held back my formal message until I knew that the astronauts had returned safely to their mother-ship. Now that they have completed their historic moon landing, I send, on behalf of Her Majesty’s Government, to you, to astronauts Armstrong, Aldrin and Collins, and to all associated with it our warmest congratulation on the magnificent success of the Apollo 11 mission. This epic voyage of discovery is an inspiration to us all. We offer our hopes and prayers for the crew of Apollo 11 for the successful completion of their mission and a safe return to earth”.